The original tenant of the one story Georgian style building at the west edge of Fulton St. Park, now Veteran's Park, was the Michigan Tourist and Resort Association, which had maintained it headquarters in Grand Rapids since its founding in 1917. Have you ever wondered about the origins and purpose of the small building at the west edge of Fulton Street Park? 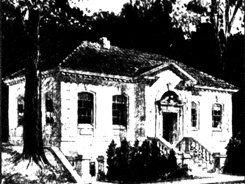 The one-story structure was designed to be in harmony with the park environment, the public library, and other buildings in the vicinity. The formal Georgian style of Architect Henry H. Turner’s design used gray cut limestone with a colonial entrance, cut stone balustrades, and a moss-green tile roof. Turner said he designed the structure to express the responsibility and hospitality of the city as well as the genuine claims of the state that it is a preferred summer and winter resort. Begun in the fall of 1935, during the depths of the Great Depression, the building was a project of the Works Progress Administration. The national program, initiated to provide jobs for the large numbers of the unemployed, was one of the first WPA projects to be approved and started in Michigan. The WPA provided $6200 for wages; the city’s cost was $5200 for materials. The original tenant of the new building was the Michigan Tourist and Resort Association, which had maintained headquarters in Grand Rapids since its founding in 1917. The association leased the building from the city, and paid an annual rent sufficient to meet the interest charges on the city’s investment. They occupied the building until 1944 when they moved to the Rowe Hotel. Since 1997 the building has housed the offices of the Children’s Museum.